If you do not work in business, you may have heard the phrase “cost-benefit analysis” only in passing. However, at the heart of this business term is a concept that can be utilized by large business owners and small business owners as well. To learn more about what a cost-benefit analysis is and how it can be used for your personal finances, keep reading below. A cost-benefit analysis is a business process that is used to determine the value of a project against the cost. A proper CBA will estimate the financial outcome in order to guide business owners to the most lucrative decision. This helps companies and finance managers determine if an investment is sound. Additionally, it may allow them to compare potential projects and weight the expected cost of each. Overall, a cost-benefit analysis involves a series of complex economic equations. However, the same principles can be utilized in a simpler format for personal use. Below are the four simple steps you need to do in order to complete your own cost-benefit analysis. The first step to completing a personal CBA is to consider the project. Are you looking to buy a new company vehicle? Do you want to replace the business interiors in your office? Anything from every day expenses and event management practices to large commercial building projects can involve a cost-benefit analysis. For owners, it is best to choose a project that has concrete value and costs. This way, you have almost exact numbers to work with as you are completing the process. Once you have chosen a project, the next step is for you to assign monetary value to everything. How much is the project expected to cost? For example, if you are looking to buy a new vehicle, be sure to have an idea of what you are willing to spend. Remember to account for fees, your first inspection, and other costs associated with the purchase. Then, consider the benefits. Does your current car require you to spend hundreds of dollars each month on repairs? Will you get better gas mileage with the new one? Do what you can to assign accurate amounts to these potential savings. It is important to remember that when conducting a cost-benefit analysis, everthing gets assigned a dollar value. Yes, that means everything. If you are dealing with a project that includes elements that do not have a specific monetary value, get creative to assign them one. For example, if you are trying to improve office morale, you can express that through things that are associated with cash value, like fewer employee absences or increased employee efficiency and employee performance. Keep this in mind when you have difficulty identifying a monetary value to a particular part of a project. After you have taken the costs and benefits into consideration, it is time to compare the difference. For personal use, a cost-benefit analysis can be done with a simple equation once you have monetized everything. First, consider how long the project will benefit you. For example, a new car should last you for approximately 10 years. Then, simply subtract the cost of the project from the benefits over time to see if it is worth it. After you have calculated the cost-benefit analysis, the final step is to make a decision based upon the final expense figure. Consider the numbers. You should have considered both direct and indirect costs and benefits. Now, you can see if the benefits are greater than the cost. If they are, it is likely a good idea to move forward with the project. Whatever you choose, utilizing this business process is a great way to lay out all of the financial possibilities. 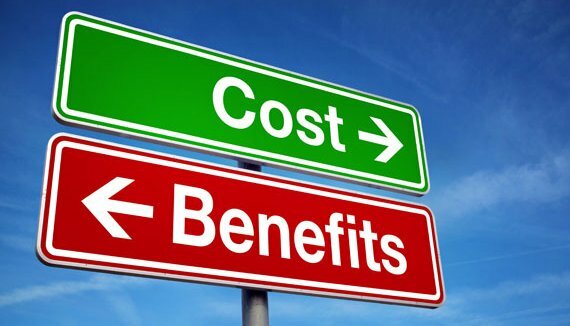 A cost-benefit analysis is a business process that helps businesses make a decision regarding expensive projects. However, you can use those same principles in your department, project or division. By taking the time to consider the costs and value of a project, you can make better financial decisions.